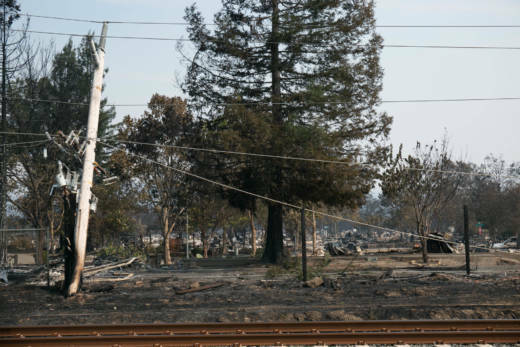 The California Public Utilities Commission voted unanimously on Thursday to strengthen regulations for utilities that have facilities in areas where thick vegetation and strong winds make fires more dangerous. Under the new rules, electric and telecommunications utilities will need to widen vegetation clearances around their lines. They'll also have to conduct more inspections of power lines, phone lines and utility poles. Property owners will also be responsible for giving utilities access to their land in risky areas. If they don't, the new rules allow utilities to cut off service to those properties. "Year-round fire is going to be the new normal in California and we need to adjust to that," said Commissioner Clifford Rechtschaffen. Utilities will have six months to make changes in the highest-risk areas, once those areas are determined by new maps that the commission is expected to approve later this winter. That obviously depends on where you live. But who's in charge of telling us how risky any one place is? Cal Fire and the California Public Utilities Commission have been working for years to make maps of the highest-risk areas in California. Those maps, once finished, could be used to hold utility companies such as Pacific Gas and Electric Co. to higher fire safety standards. After last month's deadly Northern California wildfires, some state lawmakers are saying the process of making the maps is moving too slowly, putting people's lives at risk. State Sen. John M. Moorlach, R-Costa Mesa, sent a letter to Gov. Jerry Brown this week asking him for details about what exactly the agencies have been doing. Moorlach said the whole process is taking too long. “We've got bureaucrats that are doing this and they're dragging their feet, and you've got utilities that know what the outcome is going to be and they're going to delay it as much as they can,” he told KQED. Cal Fire already has hazard maps and, based on those maps, people who live in high-risk zones face tougher construction standards. Those maps were spurred by previous legislation. Fire building codes apply only to “very high-hazard" areas within city boundaries. However, in areas where Cal Fire has jurisdiction, anything in “moderate-risk” and “high-risk" areas must meet its standards. Danielle Venton contributed to this report.